Winterbrook Estate Agents - News- Lesters Are Marketing Their Portfolio Of Riverside Properties Whatever The Weather! 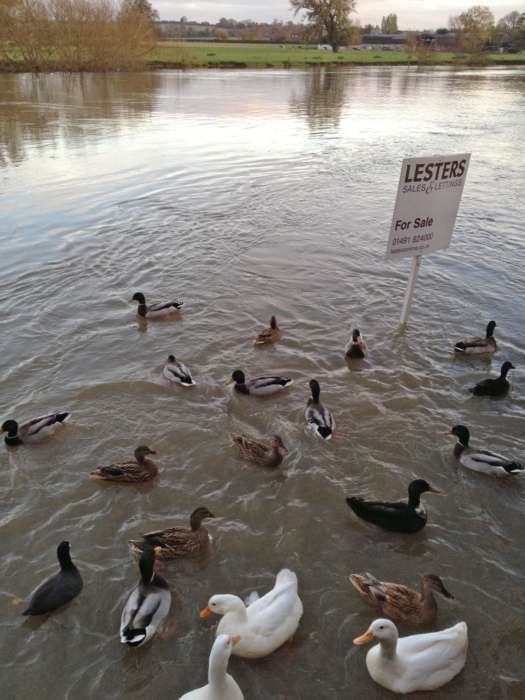 Lesters Are Marketing Their Portfolio Of Riverside Properties Whatever The Weather! Over the years we have been privileged to sell some of the nicest riverside properties in the area and this photo just shows you our marketing continues whatever the weather. This particular property in Wallingford at £1 million continues to be marketed by every way possible states Julian. Not only through our network of 700 agents, London office and all the major websites. The passing boaters will continue to see the property for sale. Now even the local wildlife are taking a keen Interest but our board`s still standing firm!